This is a mouthful of flavour. Extremely soft and chewy, full of natural ingredients and deep liquorice flavour that will satisfy your taste buds as soon it touches your mouth. No wonder why Darrell Lea Liquorice is Australia’s favourite liquorice. Made in a factory that handles Peanuts and other Nuts. 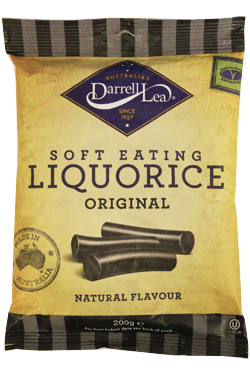 wonderful Darrell Lea licorice, always a favourite since I spent years in Australia. and now only available from you! Delicious, soft but chewy texture, lovely feeling on the tongue. A delight. Since finding this product at my local Waitrose in Dorcester, Dorset. UK I have bought it each week. I find it very addictive - in a good way! Have now got several friends hooked on it.